In realtime conditions we may be interested in executing some parts of our formula only once per bar, when a new bar is created (e.g. for auto-trading purposes or just for notification). To do that – we would need to identify the very moment when new bar appears. This can be done using static variables to record the timestamp of the most recent bar, then comparing current reading with the recorded value. Once the difference is detected – we can conditionally run our code and update the recorded time info. 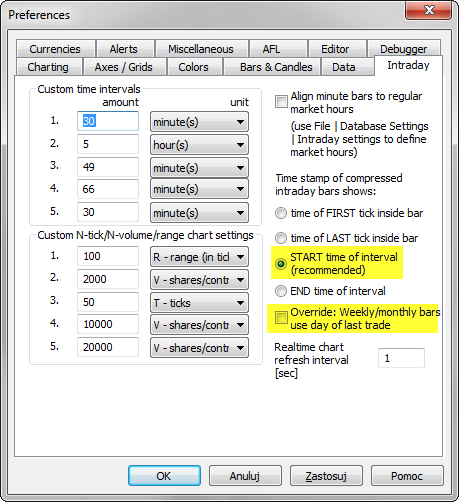 Newer AmiBroker versions (>5.60) can use this for reading last bar timestamp (this is faster than using DateTime() function). Can I encrypt my formula so no-one can decipher it?